During exercise Stellar Avenger, the Aegis-class destroyer USS Hopper (DDG 70) launches a standard missile (SM) 3 Blk IA, successfully intercepting a sub-scale short range ballistic missile, launched from the Kauai Test Facility, Pacific Missile Range Facility (PMRF), Barking Sans, Kauai, on July 30, 2009. The U.S.Navy and Missile Defense Agency (MDA) successfully shot down a short-rangeballistic missile in space in a July 30 test, agency officials announced Friday. 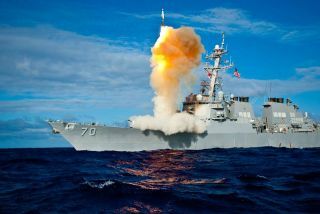 The Navy?s USSHopper and USS O'Kane destroyers detected and tracked a missile fired from thePacific Missile Range Facility at Barking Sands, Kauai in Hawaii during thetest, which was latest demonstration of the U.S. military?s Aegis Missile Defensesystem. The USSHopper fired one Standard Missile-3 block 1A missile and destroyedthe target 100 miles (160 km) above the Pacific Ocean about two minutesafter launch, MDA officials said in a statement. The test markedthe Aegis system's 19th successful intercept in 23 attempts, including anoperational mission in 2008 that destroyeda malfunctioning satellite as it re-entered the atmosphere, MDA officialssaid. The nextevolution for the missile defense system will be an upgrade to a morecapable interceptor, the Standard Missile-3 block 1B. A critical designreview for that missile was completed in May and will first be tested in late2010, MDA officials said. LockheedMartin Maritime Systems and Sensors of Moorestown, N.J. is the Aegis BallisticMissile Defense System prime contractor, and Raytheon Missile Systems ofTucson, Ariz., builds the family of Standard Missiles used in the tests.